Both teams are loaded with young talent that will end up competing on NFL rosters next season, but which players should Chicago Bears fans focus on? 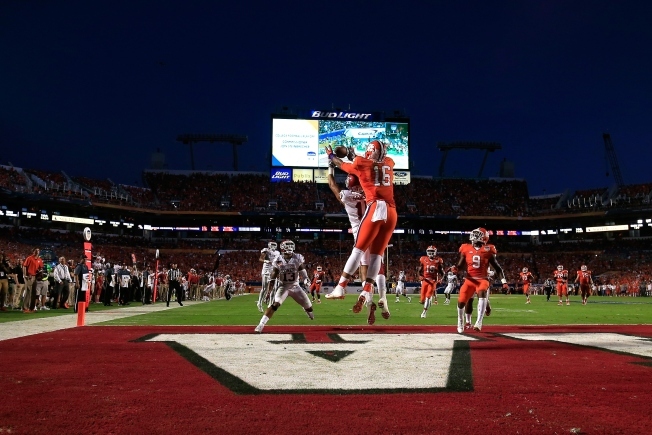 On Monday night, the eyes of the sporting world will turn to Glendale, Arizona as the Clemson Tigers take on the Alabama Crimson Tide in the second installment of the College Football Playoff’s National Championship Game. Both teams are loaded with young talent that will end up competing on NFL rosters next season, but which players should Chicago Bears fans focus on? To help with that, we have five players that could be on Chicago’s radar as the NFL Draft approaches. The Bears are pretty well set for the future at nose tackle, and they could potentially try to bring Jarvis Jenkins back to play defensive end next season, but the team could certainly use more depth at the position as they look to continue their transition into a 3-4 scheme. Allen has a ton of speed and is very strong up front, and the Bears could use an athletic player like him as an edge rusher. The Heisman Trophy-winning back routinely shows up with big performances in big games, and one could expect that he will get a similar workload against the Tigers on Monday night. He is a big, physical runner that also has deceptive speed at times, and if the Bears are serious about moving on from Matt Forte, he could provide a tremendous change of pace from Jeremy Langford out of the backfield. Under former G.M. Phil Emery, the Bears loved to draft players that were physical freaks, but even though organizational philosophy has changed under Ryan Pace, they could still take a long look at Kearse. The safety is 6-foot-5 and weighs 220 pounds, and he is an excellent coverage safety over the middle of the field. The Bears already have one solid safety on the roster in Adrian Amos, but adding Kearse could really solidify them in that spot. It’s not clear if the sophomore will declare for the NFL Draft, but if he does, he could provide an enticing opportunity for the Bears to draft a future star at the position. He is an exceptional pass-catcher, with a massive frame and the build necessary to be a matchup nightmare over the middle of the field. He of course has to work on his blocking, but he has the potential to be a really good player, and the Bears could take a look at him in the second or third round. The Bears have plenty of options at outside linebacker, but if they’re serious about improving their defense, then they could absolutely use a player like Ragland. The cornerstone of a ridiculously-talented Alabama front seven, Ragland has the ability to play well in pass coverage and the ferocity and intelligence to close gaps and make booming tackles. He could fit well in a 3-4 defensive scheme, and if he’s available with the number 11 pick, the Bears could take a long, hard look at him.